The Ableton Advanced Users Meetup: NYC Area Live Users Network! 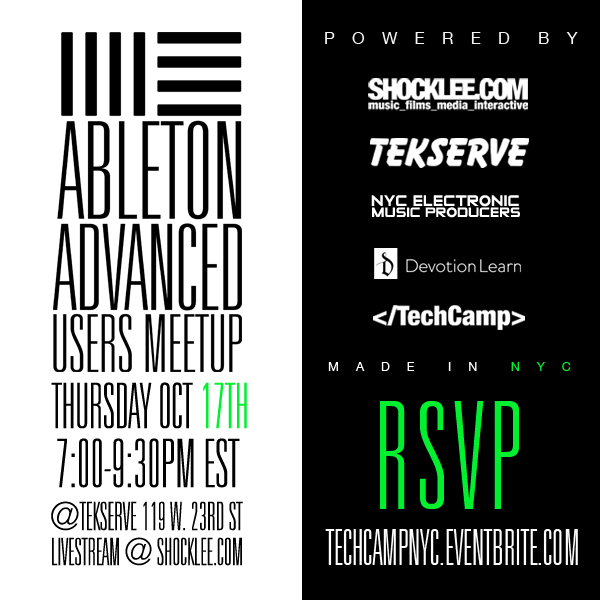 Founded by Shocklee Entertainment, The Ableton Advanced Users Meetup debuted in 2012 with the intention of bringing together the best Ableton Live ninjas around NYC for a meetup to inspire networking, collaborations and to bring together the music community in a friendly environment that’s open to anyone looking to build. The meetups feature excellent presentations from some of the most knowledgeable users around discussing the latest techniques, coolest uses, trends, tricks and real life applications happening around. The meetups take place bi-monthly at New York City’s finest techno-cultural-audio-visual retail hub for all things Apple and audio related, Tekserve and are recommended for advanced and intermediate users of Ableton. You’re invited to join us – if you’re not in the area, you can still catch us online, our meetups are live streamed on shocklee.com so come meet some of the most interesting music creators around and maybe you can come present something special at an upcoming event! Follow the Ableton Advanced Users Meetup on Facebook for group updates! TBA – Stay tuned for details.